Year 1 and Year 2 have taken part in an exciting Maths Challenge during this half term. We have all been working on improving our scores on Hit The Button. We worked on number bonds and on times tables. Every child improved their scores during the 6 week period. 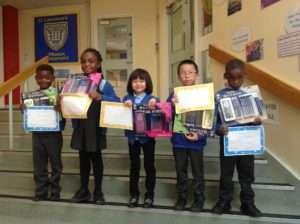 Some children were awarded prizes for learning the most facts and other children were given a prize for the most improved scores. Well done to all of the boys and girls in Year 1 and Year 2.